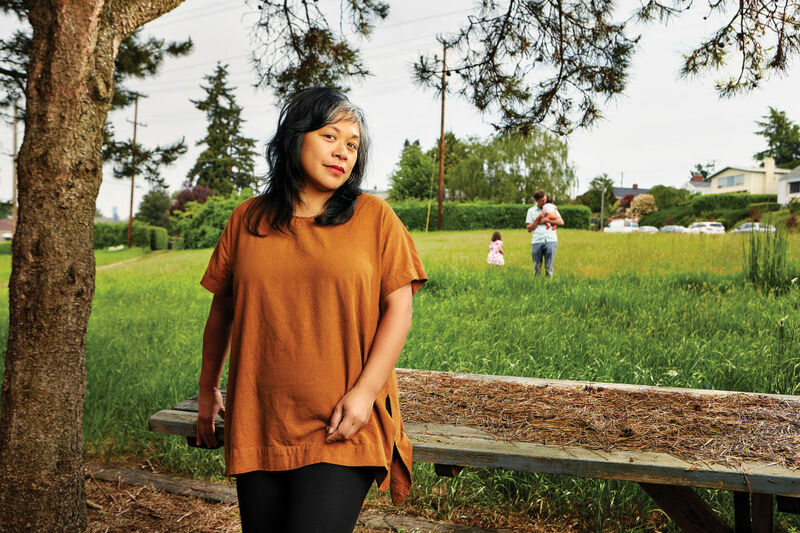 Angela Garbes photographed with her family near their home on Beacon Hill, May 19, 2018. We tend to think that you either want kids or you don’t. Most people I know are hugely ambivalent. I had read an article about the biology of the placenta, which is very similar to how cancer grows in the body. I thought that was fascinating and then I thought: Why is it that birth is so hard when hundreds of thousands of people around the world do it every day? Our culture makes it seem like a biological trap, when in fact it’s a superhuman power. To be able to grow someone, birth, and then feed them with just your body? Why don’t we give that worth and value? Pregnant women are not given the license to trust ourselves; we’re actually told not to trust ourselves because everything is a risk. There is so much that we don’t know because we’ve never valued female reproductive health. A good doctor will be honest with that fact. Science and health are built by, and for, white men. It wasn’t until 1993 that Congress passed a law saying that if you get funding from the National Institutes of Health for your clinical trials, you have to include women and minorities. I had to get to a place where I felt comfortable trusting myself interpreting data [for the book]. I realized that all science is interpretation. As long as I get the basic facts right, I’m allowed to interpret as well. Everyone is born; everyone has a mom. So, there’s a part of me that thinks what I write about should be relevant to everyone. There’s no such thing as TMI in my world. When you’re writing about these subjects, it’s so personal. It feels dishonest to not share your experience. Maybe your experience was not the same as mine, but you can relate to the feeling of having lost control of your body. When someone shares that, it awakens an emotion. People should ask questions and expect answers, even if you’re fortunate enough to have really good health care. I love my doctor. He’s great. But he couldn’t give me the answers I wanted. My mom has this congenital condition. After my brother was born, her doctor was like, “We don’t recommend having another child,” and she was like, “Yeah, but I want a girl.” She literally laid her life on the line for me.